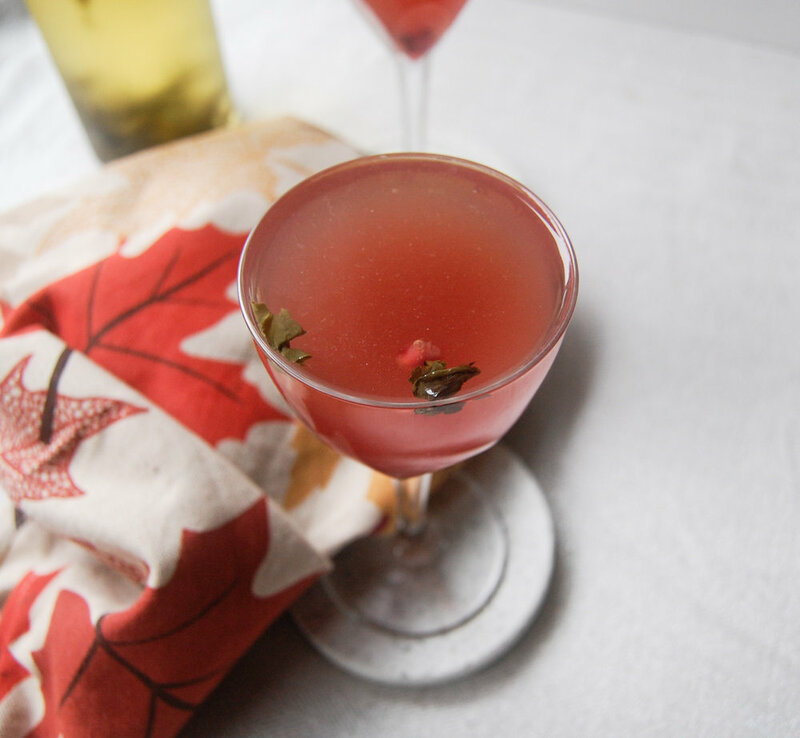 Spring is finally here and I’m excited to bring you a new recipe for a spring themed drink! I got to work with First Leaves tea and their Sencha tea! What better way to celebrate spring than with a green drink? If you’re unfamiliar with Sencha, it is a Japanese green tea. First Leaves tea’s sencha comes from Fuji City in Shizuoka. You can choose loose leaf or for an easy, on the go solution, the tea sachets. Check them out here to get 15% off your purchase! Although I made a recipe with this tea, I highly encourage you to brew the tea first to try if you’ve never had sencha! When it comes to brewing in this recipe, you can do either brew it hot and let it cool down or cold brew in advance. If you want to cold brew, run warm water over 2 teaspoons of leaves just to wake them up a bit. Place the leaves in a container and fill with 2 cups of water and leave in the fridge for about 12 hours. Make sure to taste it after 12 hours to see if the flavor is strong enough, if not you can leave it a bit longer. The way I brewed the tea for this recipe was with hot water and let the mixture cool before creating the drink. The tea pot that I used (pictured) can hold about 2 cups of water and it is suggested to use about 1 teaspoon per 8 oz so I placed 2 teaspoons of loose leaf sencha in my tea pot. At this time, I also placed the honey that I used to sweeten the margarita in with the leaves. I normally wouldn’t sweeten tea this way but it’s nice for the margarita to have a little bit of sweetness to it! Brew the your water to no more than 175 F. It is really helpful for teas like sencha to have a kettle that shows the temperature. If you don’t have one don’t panic! You can let the boiling water stand for a little bit, maybe 5-10 minutes and it should cool enough to use. Pour your water into the tea pot with the leaves + honey and brew for 30-40 seconds. Give it a stir so that the honey dissolves and strain your tea! Let the tea cool enough to use in your drink! You can refrigerate it to speed up the process or use ice in your drink to wait less time. I wanted to note that I used a matcha honey in this recipe because I had it and thought it might be fun but it is not a necessity! Salt! Who doesn’t love a salt rim?? If you don’t, skip this part :) If you do, take a lime wedge and wet the rim of the glass and then dip the glass in a plate of salt. What salt to use? You don’t have to have that margarita salt that you see at the store. If you don’t have that, you can use most sea salts that aren’t fine grain and they’ll work well. I used maldon sea salt flakes I had for this drink! In your salted (or non salted) glass, combine the juice of half a lime + 1.5 oz of your favorite tequila! I used Altos tequila. It is my go to because it’s priced well and tastes great in margaritas! I also love espolon tequila! Please feel free to alter amounts of lime + tequila to your liking! Finally, fill your glass up with the sencha + honey brew, mix, garnish with a lime and enjoy! Soooooo, I often talk to people about matcha and many people want to consume matcha in other ways besides drinking it. Matcha for me, is best consumed traditionally. I love the ceremony around whisking a warm bowl of matcha. BUT, there is also a place for matcha in our food. Many of recipes include infusing which is pretty simple, but nothing is simpler than putting matcha in food and drinks because all the work has been done for you. Matcha being in powder form allows you to be able to include it in everything! If you’ve read this blog and the recipes in it you probably can tell I’m a bit of a fan girl of Adriana over at A Cozy Kitchen. 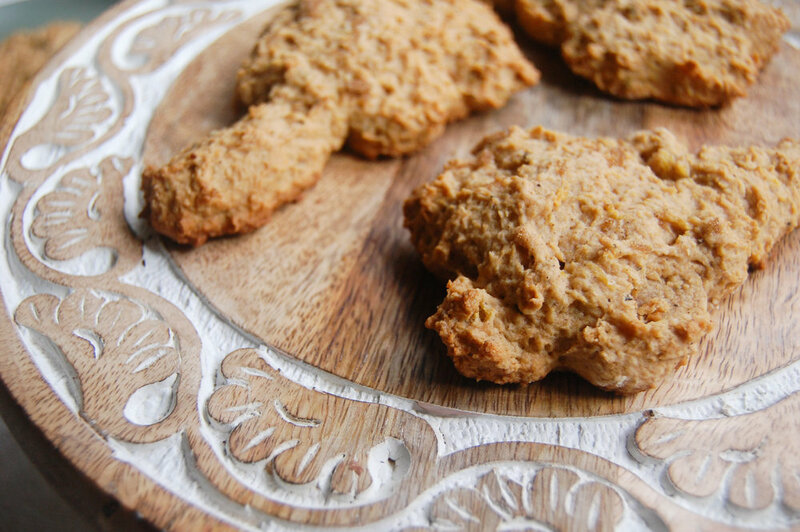 I one time made these cookies from her blog that were miso white chocolate chip cookies. They are amazing! When I was looking for a simple recipe to get me back into blogging and I thought that matcha would be such a delicious flavor with the miso! I want you to check out her original recipe because this is such a cool concept for cookie and she deserves all the credit! While you’re there make sure to check out some of her other delicious recipes! I only changed a few things to get these green goodies! -I added about 2 tablespoons of culinary grade matcha from Matchaeologist which is a fav! One more note about these, Make sure to check them because the bottoms get browned very quickly, adding another layer of parchment paper helped too! Small Announcement: I’ve missed you all! I have to admit some sad circumstances have stopped my blogging for most of December and all of January. In December, my stepdad passed away suddenly and it affected me more than I could ever have imagined. I wanted to keep going everyday which I did to a certain point but creating recipes and blogging is such an involved process and I wasn’t up for it. I appreciate your patience during my little break and I’m back in time for the holiday of love! I have mixed feeling about valentine’s day but I always try to be positive about it AND it’s an excuse to bake and cook things with hearts! Have you ever tried Kringle?? I bought one from trader joe’s around the holidays and OMG SO GOOD! After I bought that one I couldn’t find them again :( I found out that you can order them online but they are a little pricey. I was sure I could find a recipe on the internet, and I did! I used this recipe for these kringle hearts and will let you know the changes I made and how I added tea! You can find the recipe I followed here ! If I am following a recipe and want to infuse tea into it, I will look for either a liquid portion to infuse or butter! In the past I have tried to use tea in place of the warm water for the yeast and for whatever reason they have always failed! This may have nothing to do with tea but to be safe I used the milk in this recipe. The recipe calls for warm milk and so I heated the milk a bit and put 2 tablespoons of tea in the milk. I let it steep for until fragrant and when the milk was warm and not hot then I strained it and included it in the recipe. Two notes about this, use more milk for the infusion that the recipe calls for and measure the final amount added to the recipe. You will lose some milk when you heat it and strain it. You can add less or more tea depending on how strong you want the tea flavor! This recipe will not give you the thin kringle that you’re probably used to but it is still delicious. The filling is very sweet and is most of the flavor for this recipe. 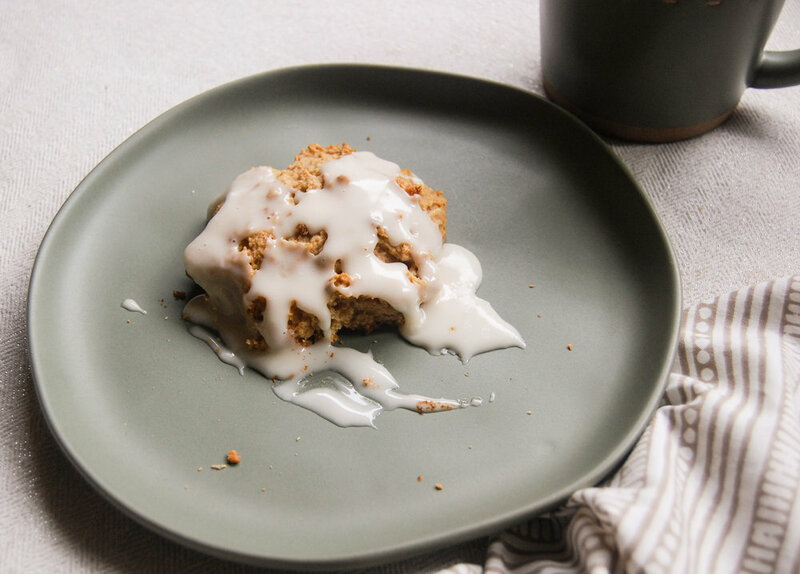 The topping which is a simple glaze makes this a great sweet treat! A note about choosing a tea for this recipe. I would suggest choosing a black tea and if you are choosing a blended black to tea remember that the flavor you choose will be subtle in the bread part of this so make sure it is a blend you like! For example, the tea I used in the blend was Amaretto Spice from The Jasmine Pearl Tea. This tea is a blend of black tea, cinnamon and amaretto flavoring. This combo was ideal because you have the extra cinnamon and almond flavor from the amaretto but nothing too overwhelming! These turned out really delicious and although they aren’t exactly like the original Kringle they have that lovely flavor! You can definitely create the shapes listed in the recipe but I will say that although the cookie cutter shape was a bit difficult to cut out since I did it after it was baked, it was nice to just give out heart shaped pieces! I didn’t decide to do the hearts until after it was baked but I think you could probably cut them out before baking and have it turn out well too! I’ll admit that I’m not a wine drinker. I’ve tried to like it but I don’t usually find it tasty, especially red wine. Most of my drink recipes are made with whiskey which is what I prefer. However, I know that many of you like wine and I’ve always wanted to try making mulled wine so here we go! After looking at a lot of recipes, I realized most of the ingredients added are just to spice it up a bit. I don’t know much about wine but I do know that I don’t want to waste a really good wine by cooking different ingredients into it. I went to the store and bought a cheap bottle because I would be enhancing the flavor. Feel free to use whatever wine you like best for this recipe! I also noticed that most of the recipes have some sort of citrus in them. What I chose to do was to use lemon and then a citrus herbal tea. I used Tangerine Ginger from Rishi Tea that came in my Sipsby box. This tea has hibiscus flowers, orange peel, ginger root, citrus oils, licorice root and schizandra berries! Yum yum yum! I chose to use tea sachets for ease but If you want to use loose leaf, you have to strain the mixture anyway! I wanted to note that this could probably taste good with many teas but I chose an herbal tea because of the high heat. The wine is already potent and I think putting something like black tea in it might run you the risk of getting a bitter flavor. A few notes about making this recipe. I like to use honey and because of that I added the wine and honey in the pan first and let them mix a little bit. The heat should be on low the entire time. After I added all the other ingredients (except tea bags) I kept it on low with the lid on and just let it simmer. I didn’t really time it, I did it my aroma. Making this wine is delicious but it also makes your house smell so good!!! Once I felt that the aroma was strong I took off the lid and saw that the mixture was bubbling a little and everything was a bit darker. The cranberries had softened etc. This is when measured the heat of the mixture. My tea bags have the temperature set to 200F and so I made sure the wine was around that temperature then added in the teabags for 5 minutes. If your tea has a lower temperature, let the mixture cool a bit! Take out your tea bags, strain and serve in mugs! This amount of ingredients was enough for 2 large mugs and a little more. At a party, it would be best to use smaller mugs and this batch could stretch a bit farther. I also garnishes with fresh cranberries, lemon peel and cinnamon! Enjoy! Do you have a favorite mulled wine recipe? I’ve had trouble finding apple cider donuts this year! Maybe I’m not looking in the right places. I did go to a fall festival which definitely had them but I couldn’t be bothered to wait in the long line. I’ve made matcha donuts, pu’er donuts and apple cider before on my blog so I thought I would give these a shot!. I based my recipe off this one which is what I think you should follow! I did make some changes which I will note below. The weather has NOT been cooperating with me so I haven’t been able to get any good photos but will update this post when I do! 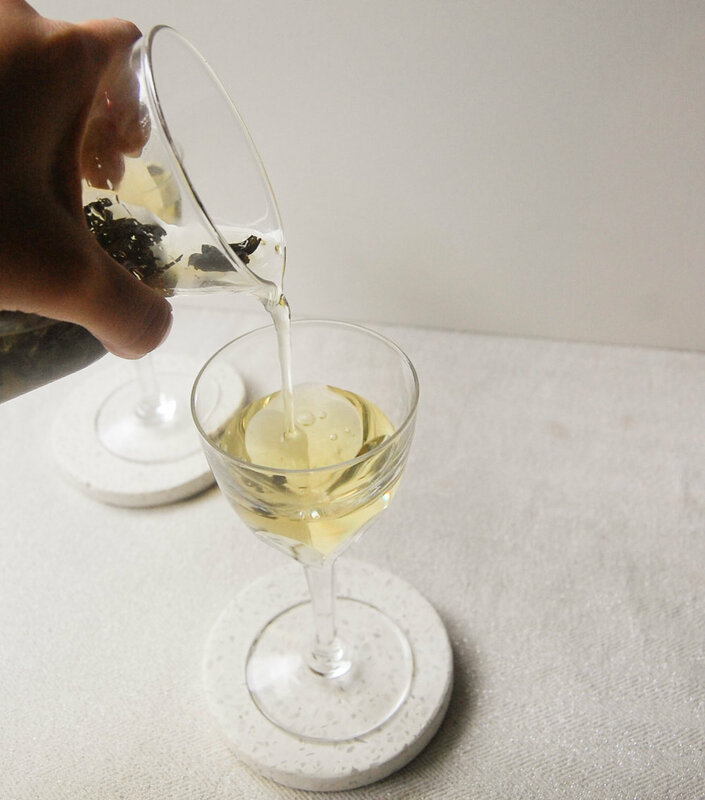 Infusing tea into the Apple Cider is very simple. If you buy apple cider, make sure to follow the recipe for the apple cider donuts and boil it down a bit. You could then, while it is hot, fill a tea bag with your desired tea and let it steep for a few minutes. When choosing a tea, do not choose a delicate tea because it will get bitter. Go for a tea that can handle hot temperatures like black tea or rooibos. I used a Lavender spice tea that has rooibos in it for my apple cider. I’ve also linked a recipe I used for apple cider infused with tea above if you want to make it from scratch! Even if you just boil apples then infuse the tea for a few minutes, it still tastes great! I made my apple cider from scratch for these donuts and it turned out well! The substitutions I made in the Sally’s Baking Addiction recipe are as follows! 1/2 cup (100g) packed light or dark brown sugar —-> I used 1 cup dark brown sugar instead of 1/2 brown, 1/2 white. I also used brown sugar for the coating. 1 teaspoon pure vanilla extract——> I didn’t have this so I didn’t use it and they turned out fine! Even though these donuts are baked, with the melted butter they almost taste fried! Fall is coming and while most people are screaming for pumpkins ( l do love pumpkins), I’m over here like woooohooooo anar season! Anar is the farsi word for pomegranate! I grew up eating this delicious fruit and when I was in High School/College it started becoming more popular in the United States particularly for it’s health benefits. More popular = available more places so it’s a win win for me! I got this gunpowder green tea from Bare Leaves Tea Co in my Sipsby box and wanted to create a simple drink with it! I was thinking of fall flavors and decided to try it with pomegranate! I decided to cold brew the tea. If you’ve never done this before it’s really simple! There are a bunch of ways you can do it but I like to take the leaves and run some warm water over them just to wake them up a bit. Then I place them in a container with water and let it sit overnight in the fridge! These leaves were probably steeping for about 12 hours. You can then drain and use! The drink is mostly made up of the cold brew tea, you should fill most of your glass with the cold brew and just top it off with the pomegranate. The pomegranate that is being added in is a syrup I made. If you want to make a large amount of syrup you’ll need to use more pomegranates but I combined the seeds of one pomegranate with 1/2 cup water and touch of honey. I let the mixture boil until the water was fragrant and had boiled down a bunch. Let the syrup cool before adding it into your tea! 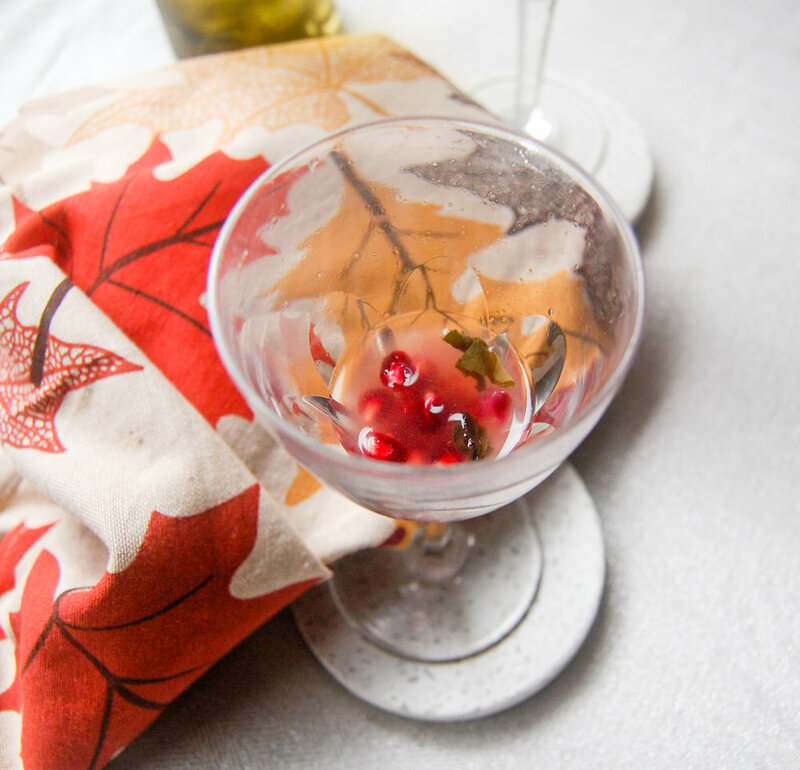 I took a few pomegranate seeds and placed them in the cup for decor and a little surprise at the bottom of the glass! I also left a few leaves in my cup for fun! I hope you enjoy it! Yes, you read that right! I decided to use some of the acorn squash I made in a recipe because I have all the fall vibes over here! Also, acorn squash is one of my favorites and although I usually just bake it and eat it, I wanted to try it in a different form. 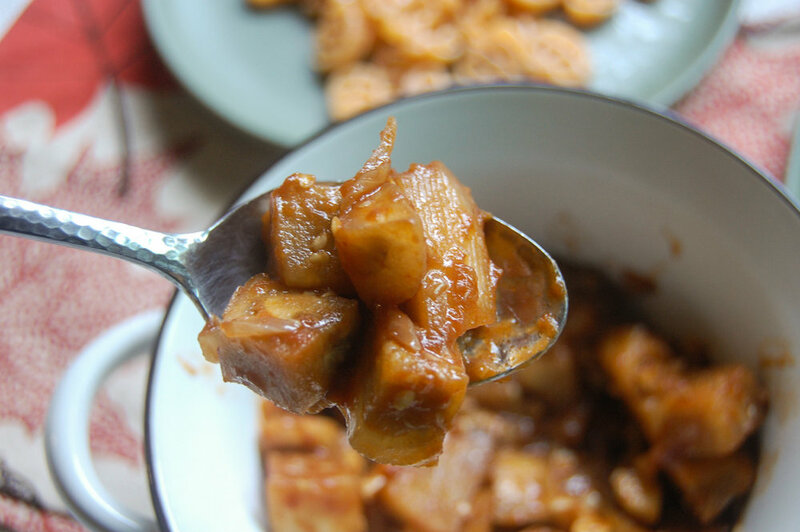 This recipe calls for 1/2 cup of cooked acorn squash. You can cook it however you’d like but I always like to bake it. I will usually place the whole acorn squash in a hot oven until it’s a bit easier to cut but this isn’t necessary. 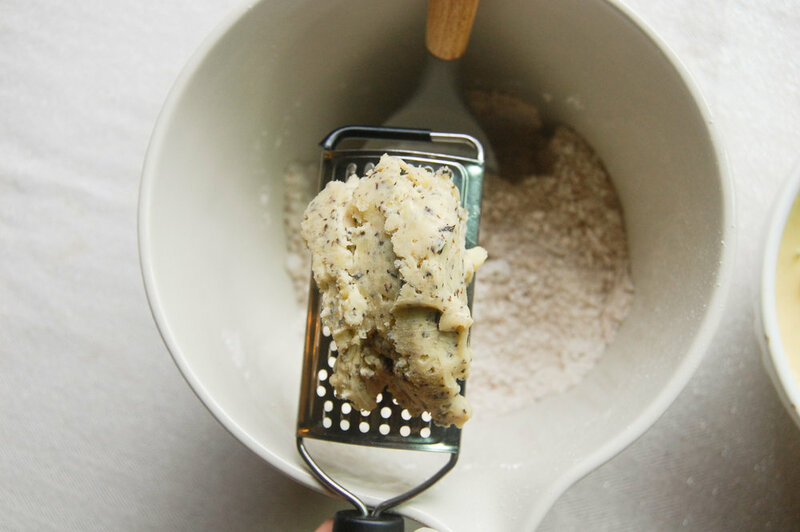 I also season it minimally because i’ts so flavorful and because it’s going into the scones. I used a little olive oil, salt and pepper. 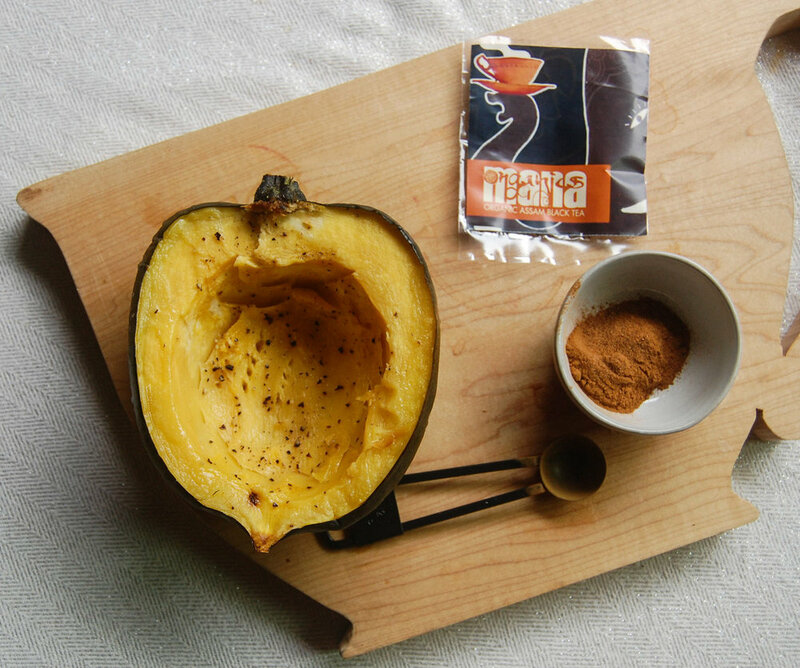 Depending on the size of your acorn squash, one half will probably be around how much you need for 1/2 cup. Something important about the butter: Make sure you give yourself time for it to freeze it! Once the tea is infused in the butter, strain it and let it sit to make sure as much butter as possible strains out. You can put it in the fridge but if you put it in the freezer it will congeal quicker. I note in the recipe to freeze them first but it’s not needed. If you do freeze them, you can easily bake some now and keep the rest in the freezer and they will be easier to handle. These didn’t change shape much while baking so I was a bit worried but they actually turned out quick delicious! They’re hardy and great for having with tea! I did want to share an easy glaze you could make but I will say that these scones don’t need it! I think you can make the glaze and have it in case but make sure to try the scones themselves too! So in the scones I used the organic assam black tea by Mana organics to infuse the butter. In the glaze I used a kenyan black tea with lemon by Ajiri Tea. All you have to do is brew the tea enough to get 1-2 tablespoons. To the tea continue to add sifted powdered sugar until you get your preferred pouring texture! Because of the acorn squash the scones are somewhat sweet but also border on savory. 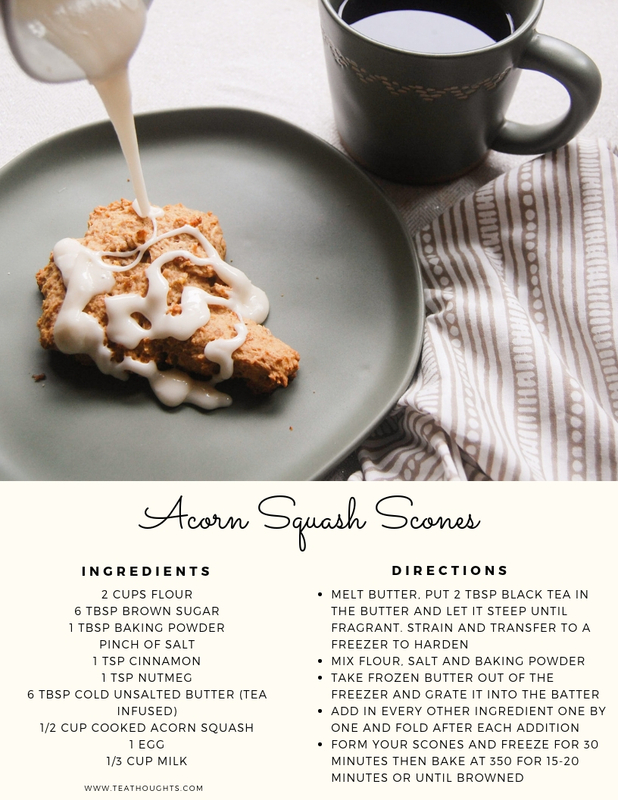 The squash is really represented well in the scone but some people might like it a bit sweeter. The glaze would come in well for that. The tea I used for the glaze has a lemon flavor which complimented the other flavors well!